We use a cutting-edge system for both the pre-location and pinpointing of leaks for confident excavation. We are able to locate leaks safely and reliably. This means that only the minimum amount of flooring or garden has to be dug up to fix the leak. The water or gas flowing out of the leak in a pipeline causes the pipeline material to vibrate. These vibrations are transmitted throughout the line and can be picked up as structure-borne noise, even at distant contact points such as fittings. The vibrations are also transmitted up through the ground to the surface as ground-borne noise, although this is very muted. Our system is able to make those vibrations audible to the human ear. If you need to know the location of plastic pipes under your flooring or garden our sophisticated equipment can accurately track their path across your property. Plastic pipes cannot be located by conventional electromagnetic means because they are not electro-conductive. A different principle is applied when locating pipes using the acoustic method: The pipes transmit mechanical vibrations better than the earth that surrounds them. 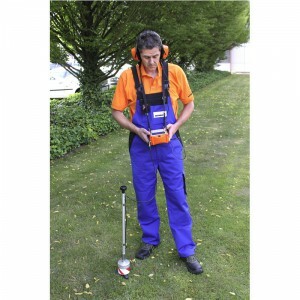 When the pipe is caused to vibrate appropriately, these vibrations spread along the pipe to the earth's surface where they can be picked up by a ground microphone. In the same way as water leaks are detected by acoustic means, the pipeline is located where the intensity is greatest.